These prices are valid both in stores and online at Nook.com. The offer ends September 28th. One could speculate that B&N is looking to clear out stock in order to make room for a new E Ink Nook and 7″ tablet, but Barnes and Noble runs so many sales that it’s hard to tell with something like this. 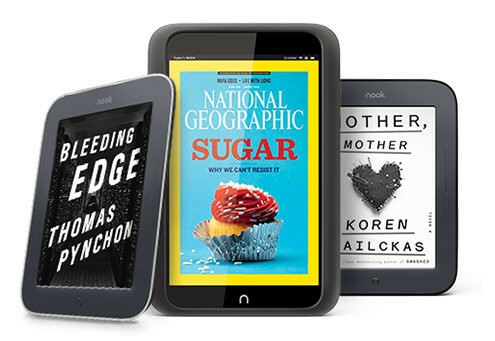 Nevertheless, a $59 Nook Touch and $109 Nook HD are really good deals. It’s easy to get desensitized by B&N’s numerous sales and the ever-decreasing prices of Nooks to the point where it’s not hard to overlook just how inexpensive Nooks are considering the prices of the competition. The Nook Touch might be old news, but when compared to what Amazon offers at the bargain end it is a much better deal. The basic Kindle sells for $69, and that requires having to put up with advertisements. It’s $89 for the non-ad model. The basic Kindle has the exact same 6-inch 800 x 600 resolution screen as the Nook Touch. Plus the Kindle lacks a touchscreen and a memory card slot. The Nook Touch gets a lot of flack for being out-dated, but really the basic Kindle is just as out-dated if not more so, and it’s more expensive. Then there’s the Nook HD for $109. The best Amazon has ever done price-wise on their equivalent Kindle Fire HD tablet is $159. Plus the Nook has the advantage with a higher resolution screen, a memory card slot, and full support for Google Play. Amazon has the reputation of having the lowest prices when it comes to Kindles and ereaders, but that’s not really true anymore, and hasn’t been for awhile, especially when considering the non-subsidized models. I really love my Nook Glow and in some ways I prefer it to the Kindle. I would like to see them do something similar to the Kobo e-ink Aura HD. I would really go for that. While I know the resolution is good, I heard the screen is not very bright on the Nook tablets, at least when compared to say the 2012 Nexus 7. I can see that some, yes. They definitely seem to be less bright for most of the spectrum of the brightness slider. At the highest brightness level it’s not bad, but mid-levels seem less bright to me. That dates back to the Nook Tablet too. I always thought they maybe did that because of the reading angle. Less brightness does help make reading more comfortable. Personally I always thought the 2012 Nexus 7 was too bright for reading and had to use a filter app to make the screen darker. With CynanogenMod you could just run it off the memory card if you wanted to try it out on your wife’s Nook HD. Running it off the memory card won’t change the regular Nook’s functionality whatsoever. Thanks, after quite a bit of reading, I got it working. After trying CM 10.1, and then re-reading Nathan’s Hisense Sero 7 Pro review, I think I might be better off with that instead. It’s $20 more at $129, but it’s got a few more features: GPS, HDMI. The one plus for the Nook HD is CyanogenMod meaning I can hopefully still upgrade Android in the future. Someone has a CM recovery working on the Hisense with a stripped down stock ROM, so there’s potential for future CM releases. Nathan: which would you choose at these prices? That’s a tough one. Another plus for the Nook is that it has a higher resolution screen, which is better for reading and web browsing. But if it were me I’d probably go with the Hisense for the added features. HDMI, GPS, and the cameras do come in handy at times. Of course you can use WiFi GPS on the Nook and get an adaptor for HDMI, so those aren’t out of the equation entirely. I ended up buying the Hisense. Couldn’t be happier; it’s a great tablet.